On Friday 27 July 2018, all of us in the UK will be able to watch a total eclipse of the Moon where the Moon will be in the shadow of the Earth for the longest amount of time this century. Those looking out on Friday will see that the Moon is a deep red colour whilst it is in “totality” as it rises (at 20:50 BST in Hatfield, Hertfordshire). It is this red colour has led to the name ‘Blood Moon’. A total eclipse of the Moon occurs because the orbits of the Sun, Earth and Moon align such that the Moon moves directly into the shadow of the Earth. An alignment like this is also known as a syzygy, a (usually) straight line arrangement of three or more Solar System objects. However, unlike a Solar Eclipse where the Moon blocks out the disc of the Sun, we can still see the surface of the Moon during a Total Lunar Eclipse. This seems like it wouldn’t be possible, as the Earth is blocking the light from the Sun, but during totality light from the Sun is scattered through the Earth’s atmosphere and still reaches the surface of the Moon, an effect known as Rayleigh Scattering. Rayleigh Scattering is what causes the sky to be blue and sunsets to appear red. The scattered light reaching the Moon is from the sunsets and sunrises all around the world. You may not see the Moon from the moment it rises depending on what objects are on your eastern horizon – try to find a location with as few trees and buildings as possible. The Moon will eventually rise above any objects in your view and you will still be able to see the Blood Moon as the point of “greatest totality” (GT) occurs at 21:21 and totality continues until 22:13. Totality is when the Moon is in the full shadow of the Earth, the “umbra” (Latin for ‘shadow’). 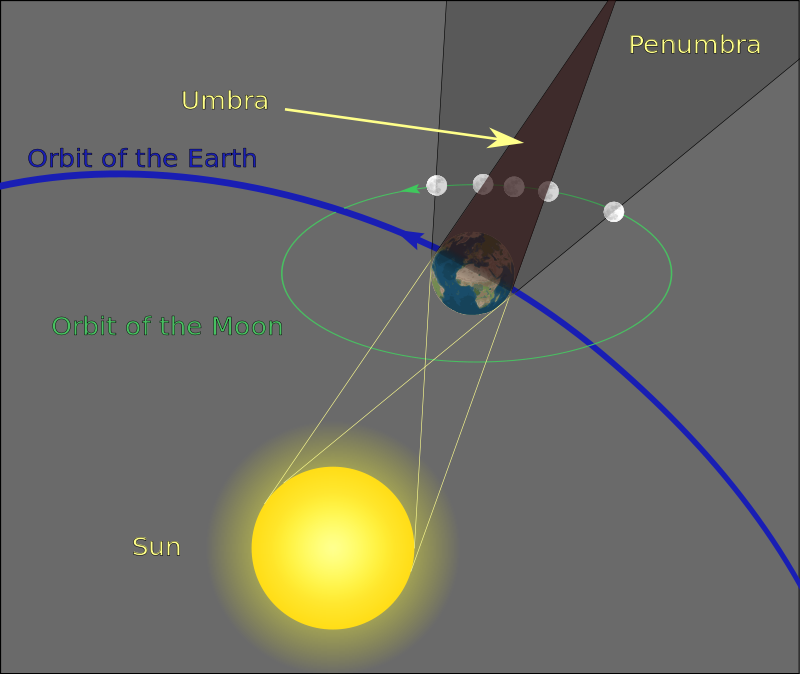 The Moon will remain in the partial shadow of the Earth, the “penumbra” (pen, from the Latin for ‘almost, nearly’) until after midnight at 00:28, so there is plenty of time to see different parts of the eclipse. This eclipse is extra special as the Moon is in totality for 103 minutes, the longest that will occur in the 21st century. Furthermore, it is a “Micro Moon”, where the Moon is furthest from the Earth in its orbit (apogee), appearing approximately 6 % smaller than an average Full Moon. Somewhere between 3-5 Total Lunar Eclipses occur approximately every 5 years, but from any one location on Earth, the chances of viewing one is approximately every few years. For example, the next five total lunar eclipses visible from the UK, which include greatest totality, are: 21st January 2019 (greatest totality 05:12), 16th May 2022 (GT 5:11, occurs as the Moon sets), 31st December 2028 (GT 16:51), 18th Oct 2032 (GT 20:02) and 14th April 2033 (GT 20:12, occurs as the Moon rises). The previous total lunar eclipse visible from the UK was on 28th September 2015 (GT 03:47). As you can see from these dates, they don’t occur very often and the time that they occur can be relatively ‘unfriendly’ if you don’t want to get up early or stay up late to watch it. If possible find a good eastern horizon, free of trees and buildings. Pack a folding chair of blanket, a light jacket (despite the warm weather the evening will a lot cooler especially if you are exposed or higher ground), and some snacks (who doesn’t want to snack while watching an astronomical phenomenon), a camera and friends and family.